Theory of evolution. 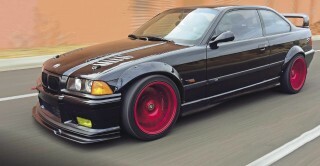 With wide arches and a supercharger under the bonnet making 400hp, this full-on E36 M3 is one ferocious street beast. Words and photos: Zach Mayne. 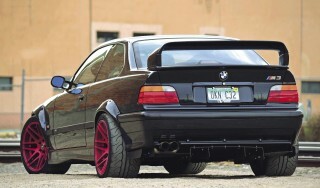 There is no doubt that the BMW E36 3 Series is one of the most popular BMW tuning platforms in existence. It’s easy to see why. The third generation Three –particularly the M3 variants – boast some of the best handling and steering available in an older BMW, which in turn makes them ideal driving machines, even in stock form. And while the U.S. market missed out on the 286hp engine that the Euro market cars were powered by, the S50 and S52 engines fitted to U.S.-spec M3s are engaging, revvy engines in the best tradition of iconic BMW inline-sixes. And if stock isn’t your thing, the E36 chassis can handle just about any modification you can choose to throw at it, from high-powered forced induction set-ups to large displacement Yankee V8s. Add in a plentiful aftermarket network with a seemingly endless number of ways to improve upon the E36 and the appeal is self-evident. Britt was exposed to cars and the tradition of hot-rodding them while growing up in Brighton, a small town just outside of Detroit, Michigan. Brighton is considered by many to be the spiritual birthplace of the American car industry. The first Ford was assembled a few blocks off Woodward and the town lays claim to the annual Woodward Dream Cruise, an event that attracts droves of car enthusiasts to take in the spectacle of over 30,000 cars cruising through the town’s main drag. Being around the American muscle car culture celebrated on Woodward certainly had an influence on Britt. As a long-time car enthusiast he’s owned a wide variety of four and two-wheeled vehicles. Everything from American muscle by way of a ’1968 Pontiac GTO to an assortment of Hondas, Subarus and VWs, to name but a few, have passed through his hands. But while numerous cars have come and gone, his E36 M3 Coupé has earned a permanent place in the garage. Since acquiring it in 2011, the black BMW has evolved from a stock and original car to something far more extreme. When he originally came across the BMW in 2011, Britt was actually stationed halfway round the world at Combat Outpost Sanchez in Eastern Afghanistan, serving as a communications specialist for the U.S. Air Force. To kill time when he wasn’t working, he was either hitting the gym or surfing the Internet. During one of those online sessions he spied a perfectly preserved 1995 M3. It was for sale in Fargo, North Dakota, about four-and-a-half hours away from his then-home in Minot, North Dakota. According to the online ad, the person who was selling it had stored it carefully in a heated garage and even claimed that the back seats of the car had never been sat in. Despite being unable to see the car in person before making the decision to purchase it, Britt reached out to the seller and expressed interest in it. 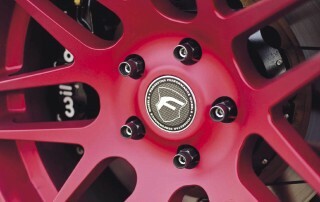 The first upgrade that the BMW was treated to was a set of larger Linea Corse wheels and appropriate tyres. But that was a small step in what would become a much longer journey of transformation that would see the M3 evolve far past its original performance. Thanks to the fact that E36 M3s were being imported to the U.S. beginning in 1995 there are a plenty of ways to improve their performance. The naturally aspirated approach can add power to the S50 engine with upgrades like hotter camshafts, free-flow exhausts and other bolt-ons but to get really big power from these engines forced induction is generally the path of least resistance – and big power was exactly what Britt was after. Once he had settled on the method, a decision had to be made between supercharging or turbocharging. Britt elected to go with supercharging, which is easier on the engine as well as simpler to install than a turbo setup. Another reason for supercharging was the power delivery; “I decided to go with the supercharger kit over a turbo to have a better power range without suffering from lag,” he explains. “I ended up ordering the Stage 2 supercharger kit and full header-back exhaust from Active Autowerke.” The Florida-based company claims an increase from the stock S50’s 240hp to up to and even over 400hp, an amount that Britt figured would keep him happy for a while. Once the kit arrived on his porch in a stack of boxes he proceeded to install the setup himself in his garage. “The installation instructions were fairly well written and included pictures,” he notes. The conversion to forced induction centres, of course, around the HKS 8550 model centrifugal supercharger, complete with intercooler. The kit includes a recirculating blow-off valve, larger and better-flowing 44lb fuel injectors and a Walbro 255lph in-tank fuel pump to feed them. Britt didn’t stop with the supercharger kit, though, and also opted for an Active Autowerke header, track pipe and dual-tip “Signature” exhaust. With the exception of a thermostat that opens at a lower temperature, things have been kept stock in the cooling system, a setup that he says works just fine, even on the hottest of days. Britt also notes that another aspect of the M3 that is holding up surprisingly well is the stock clutch and gearbox. The only change to the gearbox was replacing the OEM lubricant with Royal Purple transmission fluid while on the driver’s end is a UUC short-shift kit for quicker, more precise shifts. Long-term goals for Britt and his M3 include the possibility of entering the car in the challenging Pikes Peak International Hillclimb in Colorado, albeit with the car in a far more extreme state of tune than it’s currently in. With that goal in mind and knowing the BMW would need plenty of grip to tackle Pikes Peak, the M3’s exterior has been modified with a set of arch flares to accommodate the massive wheel and tyre setup that was planned for the car. “I’ve done all of the work so far, minus the bodywork,” says Britt, who was transferred a few years ago to Kirtland Air Force Base in the south west U.S. state of New Mexico. Paint and bodywork being the somewhat black art that it is, the M3 was handed over to Superior Customs in Albuquerque, New Mexico where a set of arch flares from DTM FiberWerkz were installed and painted body colour; the process of installing the flares wasn’t all that simple and required extensive reworking and fitting by the body shop in order for them to fit properly. A fibreglass vented bonnet from MAShaw replaced the stock item while the bottom of the already aggressive stock front bumper gained a deeper lip from Rieger; there are also blacked-out ECS Tuning kidney grilles and fog lights that have been tinted with yellow Lamin-X vinyl tint. Britt also went to the trouble of sourcing a set of Euro glass headlights, which hold up far better than the plastic U.S.-spec headlights. Towering over the trunk is an MAShaw E36 M3 Lightweight-style wing, giving the car a track-ready vibe while rounding off the exterior changes is a Fancywide lower rear diffuser. With the arches considerably flared, Britt shopped around for the ideal wheels to fill them. The solution came via a set of Forgestar F14 wheels that measure 10x18” up front and a generous 11x18” at the rear, wrapped in sticky Yokohama AD08R rubber measuring 265 across up front with 295s at the back. The wheels sit on a stud conversion kit and behind those super-deep concave spokes are Wilwood six-piston calipers and 330mm two-piece discs up front, with four-piston calipers and StopTech slotted discs at the rear, along with Wilwood hoses all-round. With track days and weekend canyon carving in mind, Britt installed a set of KW V2 coilovers, allowing the optimal ride and handling to be dialled-in. Vorshlag camber plates allow the front camber to be adjusted easily and there are also Rogue Engineering rear shock mounts and rear camber arms. Considering the extreme statement that the exterior of Britt’s car makes, it’s no shock that the interior has been upgraded with track use in mind. The original Vader M3 seats that the BMW left the factory with were removed and sold on to make way for a pair of deeply-bolstered, one-piece Sparco Circuit II race buckets bolted in place with Brey-Krause seat mounts. There are also Sparco six-point harnesses for the driver and passenger, held in place with a Brey-Krause harness bar. Continuing the track-focused theme is a grippy, suede-upholstered Sparco R353 steering wheel; the wheel uses a flat bottom for more legroom and can be easily removed via a quick-release adapter that is welded to the M3’s steering column. One would think that the current extreme state of tune that Britt’s E36 M3 enjoys would be enough to satisfy the speed demon in him. The reality, though, is that for this enthusiast the envelope must always be pushed. To that end, Britt is plotting an LS1 V8 conversion to take the BMW to the next level of performance. It may offend the purists, but we can’t wait to see the next stage of evolution for this ongoing epic E36 build. Wide arches give this M3 some serious stance AEM boost Gauge. Brey-Krause harness bar. Sparco Circuit II bucket seats. 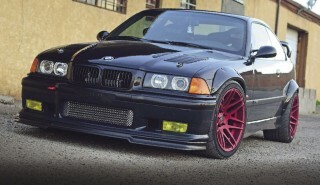 This E36 is seriously menacing. HKS 8550 supercharger makes 400hp Dinan strut brace. Forgestar 18s measure 10” wide up front and 11” at the rear.